Here you'll find a selection of previous projects. We collaborated with a team of year 6 pupils to create starry images to decorate their school corridors. The aim was to uplift the space and inspire the younger pupils to learn their times tables. We can create artwork any shape or size based on any topic. If you would like to know more please visit our 'Murals For Schools' page or email us through our contact form. These projects were all based around school values, aims and rights. Each project is totally unique and we always work closely with each school to ensure the children understand the project and the meaning behind it. The school also gets the artwork in file form to use for printing in classrooms, postcards, for web, t-shirts etc. 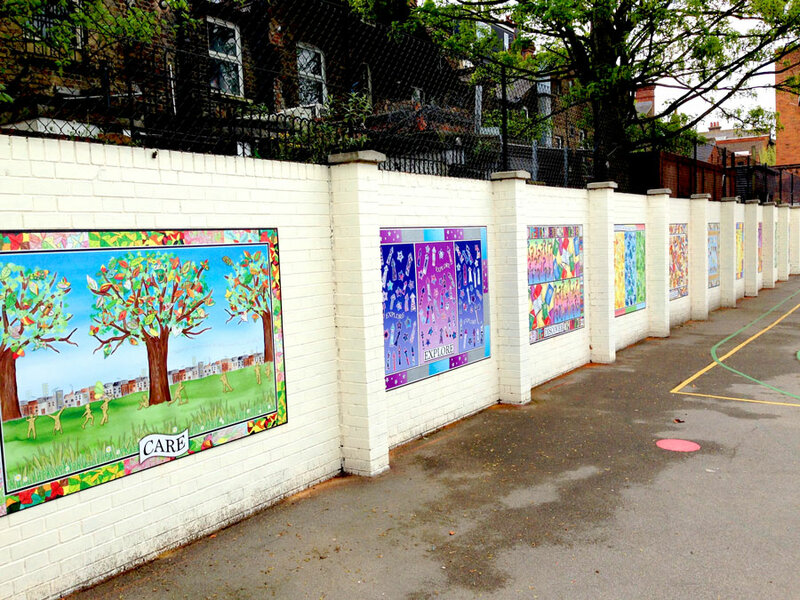 We worked closely with a North London primary school to create 57 bespoke corridor displays. The aim was to uplift the spaces by creating inspiring displays that are easy for the teachers to use and maintain. The displays are printed onto a durable surface and designed to be attached to existing display boards using staples. Children’s classwork and school information can then be attached using tac. We can create displays any shape or size based on any topic. If you would like to know more please visit our 'Displays For Schools' page or email us through our contact form. These images showcase school aims, goals and core values in the playground. Each image is printed onto a durable outdoor material which is easy to install. We worked closely with the school to make sure that each piece was bespoke and unique. These panels can be made based around any topic and installed inside or outside the school. A project like this can also involve children during the design process. To view more projects please visit our 'Gallery' page. We worked with over 200 children to complete these large images based on the Saints. Each class worked closely with our workshop providers to complete images to represent stained glass windows. Once the children had finished their individual drawings we incorporated each design into these striking murals. 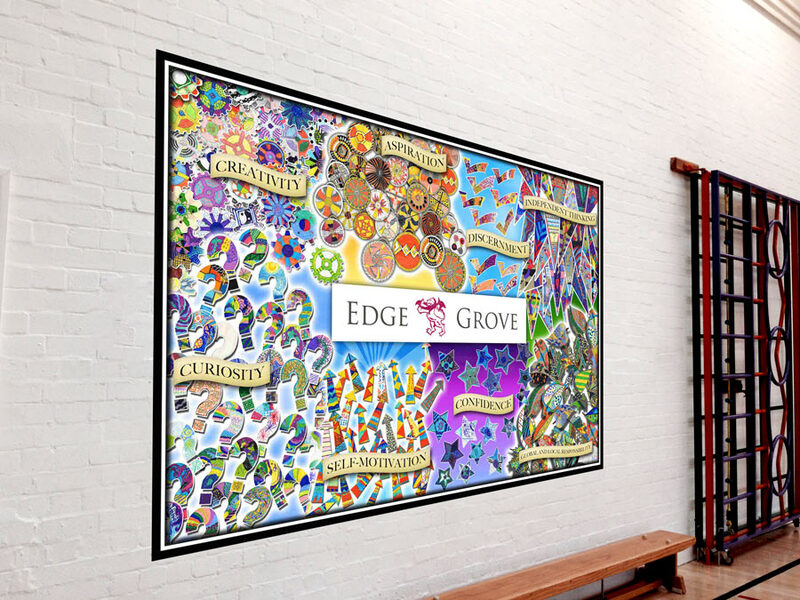 Each class now has one installed in their classroom and the school has the artwork on file to use for postcards, stickers and web use.